Zakopane is a place full of attractions. Go hiking and discover beautiful views of the Tatras or visit interesting city center! The Dunajec gorge is considered to be one of the most beautiful river gorges on the continent. The harsh bends and 300-meter-high rock walls, stretching over the distance of 8 kilometers, are breathtaking for everyone moving down the river. Rafting excursions on the Dunajec River have been organized since the beginning of the 19th century, They are considered to be one of the most amazing experiences of the Pieniny Mountains. Rafters use characteristic boats whose combined hulls resemble ancient rafts. The season on the Dunajec river lasts from the beginning of April till the end of October. It is a tourist symbol of the Polish Tatra Mountains, the largest lake located in the Polish Tatras. It is located in Dolina Rybiego Potoku, right at the feet of Mięguszowieckie Szczyty. The lake is located at the altitude of exactly 1395 meters above sea level, its area stretches to 34.93 ha. Morskie Oko is 862 meters long and 568 meters wide, while the maximum depth is just over 50 meters. It is one of the few lakes where fish, in particular, trout can be found in their natural habitat. Rybi Potok flows out of Morskie Oko, creating a number of smaller lakes along the way. The waters of the lake are fed by two mountain streams: Czarnostawski Potok and Mnichowy Potok. The ascend to Giewont is a dream come true and a big challenge for many beginner hikers. It also plays a significant role in the patriotic and religious context. Patriotic, as the legend says, a detachment of the Polish knights is sleeping in a cave on the slopes of Giewont. The soldiers shall rise up and engage in a battle when the homeland is in danger. Besides, Giewont itself resembles a sleeping knight. The summit is also important from a religious point of view. It is difficult to imagine the shape of Giewont without the 15-meter-long iron cross standing on the top. The crucifix was built in 1901. It was assembled from 400 separate elements, manufactured in one of the Krakow's factories. Consequently, Giewont is extremely popular. The valley is considered as the most beautiful in the Tatras. It is a very attractive destination itself but it can also be a great starting point for trips to the higher parts of the mountains. During the expedition, you will pass Siklawa - the largest waterfall in the Tatra region (about 70 meters high). You will come across the longest and the deepest Tatra lake - Wielki Staw Polski and the highest elevated Polish lake (1890m above sea level) - Zadni Staw Polski. You will reach the uppermost hostel in Poland (1670 m above sea level). From the Valley, we can set off to the Kozi Wierch Valley, which is the highest non-border peak (2291m.n.m.) entirely located in Poland. The Five Ponds Valley (Dolina Pięciu Stawów) is absolutely worth visiting, regardless of the season. Nosal is popular with tourists and skiers. The Nosal Ski Center is located on the forested northern slope. It offers several lifts. Starting from the upper station, you can take a ski slope leading through Nosalowa Przełęcz and Kuźnice. The name of the mountain comes from the shape of the rocks from the north-west side which resembles a nose. It is the end of the north-eastern ridge of Kasprowy Wierch. From the top, although not high, there are interesting views of Czerwone Wierchy, Giewont, the area of ​​the Bystra Valley, and granite peaks rising above the Gąsienicowa Valley and the Pańszczyca Valley. The year-round funicular from Kuźnice to the top of Kasprowy Wierch in the Tatras goes through the area of ​​the Tatra National Park. The length of the route is 4252.81 meters. The railway covers a 936-meter difference in height with the average inclination of 22%, moving on 6 supports. The building of the upper station accommodates a restaurant, a kiosk, a ski workshop, a storage room for equipment, and a small hotel for 11 guests. In winter, a four-person lift operates in Kocioł Gąsienicowy. It is 1180m long with the level difference of 352 m. On the other side of Kasprowy Wierch, you will find Kocioł Goryczkowy with own lift operating in winter. Wielka Krokiew is a ski jumping hill in Zakopane, situated on the northern slope of the Krokiew mountain in the Western Tatras. It is a natural hill, located on a mountain slope, surrounded by the forest. It was built according to the design of Karol Stryjeński, ceremoniously opened on March 22, 1925. It is the oldest and the largest ski jumping hill in Poland. Its construction point is located at the height of 125m and its height equals 140 m.
It is also one of the two hills in Poland (next to the ski jumping hill of Adam Małysz in Wisła) equipped with snow tracks which allow jumping at a temperature of around 20 ° C.
The name Gubałówka stems from the Gubałówka glade located on the top of the mountain, the name of the glade itself comes from the name Gubała. There is a funicular railway built in 1938 leading from Zakopane to Gubałówka. 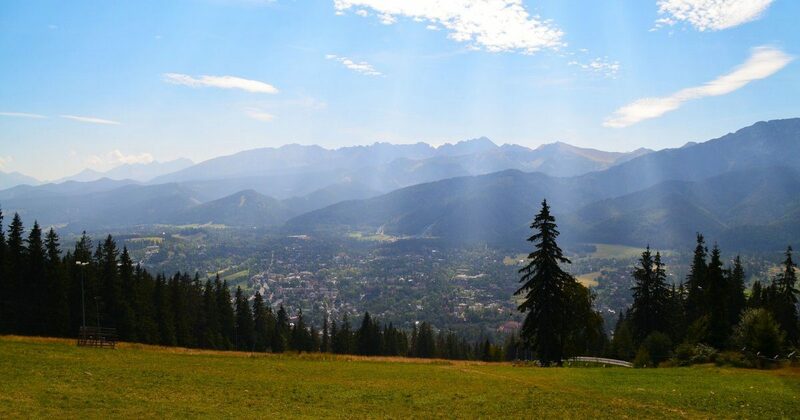 From the ridge of Gubałówka, you will see the stretching panorama of the whole Polish Tatras, Zakopane, Podhale, Pieniny, Gorce, and Beskid Żywiecki including the Slovak part. Gubałówka is the starting point of the hiking Papal Trail leading to Butorowy Wierch, 1160 m, where you can take a chairlift to Kościelisko. At the top, you will find Gubałówka ski resort, with routes leading down the Gubałówka Glade, a snowboard pipeline and a snowpark, as well as a gravity slide. Numerous private ski lifts are open in the winter. This is one of the oldest regional museums in Poland established by the Society of the Tatra Museum in 1889. The museum has 11 branches, seven in Zakopane, one in Chochołów, Czarna Góra, Jurgów, and Łopuszna. Currently, the headquarters are located in Zakopane at 10 Krupówki Street. The first collections for the Museum were handed over by Dr. Tytus Chałubiński. They included rock collections (1873-1887) and moss herbarium (over 2,700 pieces), specimens of the Tatra fauna (about 400 pieces) from Antoni Kocyan collection. Stanisław Drohojowski donated ethnographic collections (1889). The museum is located in the house of Jan Kasprowicz, in Zakopane, on the slopes of Gubałówka, which the poet acquired it in 1923. Kasprowicz Museum was created in his villa house in 1950 based on the initiative of his wife Maria. The will of the widow of Kasprowicz was to preserve the appearance of the house from the times of the poet's life. Visitors can view three rooms: dining room, living room, and bedroom. You will find family souvenirs, utility objects of the Kasprowicz family, paintings, and the remains of the book collection. On the first floor, there is a painting gallery of Władysław Jarocki, a professor at the Academy of Fine Arts in Krakow. It has been arranged by the poet's daughter, Anna Kasprowicz-Jarocka. The Museum in Opolanka consists of four rooms in the former flat of the Makuszyński family. The collection includes a set of books consisting of consecutive editions of the writer's works, the historical and literary literature on his work, and diaries. The writer's archive does not only include Makuszyński's manuscripts, but also a rich collection of letters from prominent writers, painters, musicians, theater people, scholars, politicians, as well as a large collection of letters from the readers. The collection comprises paintings and sculptures by renowned Polish artists, illustration projects of Makuszyński's books, antique furniture mostly in the Biedermeier style, miniatures, old artistic fabric, numerous works of old applied art. The villa is the third work of Stanisław Witkiewicz, the creator of the Zakopane style. The project was created in 1894-1895 for Bronisława and Wincenty Korwin-Kossakowski. The building was constructed by the highland carpenters under the direction of Wojciech Roja and Jan Obrochta in 1895-1896. The works commenced based on the sketched plans prepared by Witkiewicz. The construction began in the spring of 1895 and was completed in June 1896. Kossakowski commissioned the production of furniture to Kazimierz Sieczka. Willa Oksza is located at 25 Zamoyskiego Street in Zakopane. The place of the exhibition, the cottage - located near the famous Kościeliska Street, which in the past belonged to Gąsienica-Sobczak family. It is one of the most valuable monuments of the folk architecture in Zakopane. The interest in the building and the original Podhale ornamentation developed gradually from the beginning of the 19th century, gaining momentum at the end of the same century. The oldest part, Chałupy, was built around 1830. The current condition is the result of the expansion which took place at the end of the 19th century. The exhibition is held in two rooms at the front of the cottage.